Reporter puts Obama on spot for EU exit that 'is none of your business,' as UK politicians claim he has 'grudge' from colonialism. US President Barack Obama was put on the spot in London on Friday, when he was asked by a BBC reporter if it is any of his business whether the UK stays in the European Union (EU), indicating the backlash to his pressing for the UK to remain in the EU. 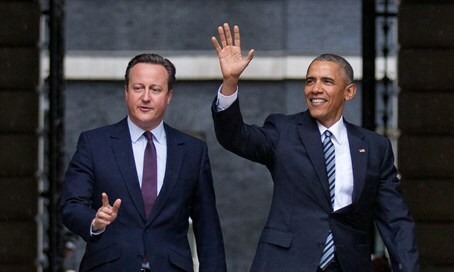 Obama has been pushing to avoid a 'Brexit' as has UK Prime Minister David Cameron, but his comments ahead of the June referendum on the subject has raised a fury in Britain by those who view him as meddling in British democracy. Two prominent politicians - London Mayor Boris Johnson and euroskeptic Ukip party leader MP Nigel Farage - even went so far as to say on Friday that Obama is opposing a UK exit from the EU because of his Kenyan background, claiming he has lingering hostility from British colonialism fueling his apparent opposition to greater British independence. In the press conference on Friday, Obama was asked by the BBC reporter whether he was saying the special relationship between the US and UK "would be fundamentally damaged and changed by our exit? If so, how?" "And are you also, do you have any sympathy with people who think this is none of your business?," added the reporter. Addressing Cameron, she said, "some of your colleagues believe it’s utterly wrong that you have dragged our closest ally in the EU referendum campaign, what do you say to them? And is it appropriate for the Mayor of London, Boris Johnson, to have brought up President Obama’s Kenyan ancestry in the context of this debate?" Cameron answered first, saying that questions on Johnson's comments need to be directed to Johnson, and then he gave a plug for the UK remaining in the EU. He said he has no power over Obama to have made him come visit and support his campaign to stay in the EU. Then Obama spoke for a long time about a bust of Winston Churchill in the White House, in a response to Johnson's criticism alleging he removed the bust from the White House upon taking office in 2008. He said the special relationship between the US and UK is strong and will remain that way, and because the ties are strong he feels free to tell the UK that it should stay in the EU. The reference to the London Mayor came after Johnson earlier on Friday wrote an op-ed in The Sun, blasting Obama's visit to persuade the UK to remain in the EU. He also referenced a discredited story claiming Obama removed Churchill's bust from the Oval Office in 2008, writing, "some said it was a snub to Britain. Some said it was a symbol of the part-Kenyan President’s ancestral dislike of the British empire – of which Churchill had been such a fervent defender." "The US guards its democracy with more hysterical jealousy than any other country on earth. For the United States to tell us in the UK that we must surrender control of so much of our democracy – it is a breathtaking example of the principle of do-as-I-say-but-not-as-I-do. It is incoherent. It is inconsistent, and yes it is downright hypocritical," wrote Johnson. "The Americans would never contemplate anything like the EU, for themselves or for their neighbours in their own hemisphere. Why should they think it right for us?" Then shortly afterwards on Friday, Ukip party head Nigel Farage told BBC Radio 4 that Obama has a "grudge" against Britain because his father was Kenyan. He said Obama doesn't want Britain to be an "independent voice on the world stage," adding, "I think Obama, because of his grandfather and Kenya and colonization, I think Obama bears a bit of a grudge against this country." "Look, I know his family’s background. Kenya. Colonialism. There is clearly something going on there," said Farage. Speaking to The Guardian, he said, "it’s just that you know people emerge from colonialism with different views of the British. Some thought that they were benign and really rather good, and others saw them as foreign invaders that kept people suppressed. Obama’s family come from that second school of thought and it hasn’t quite left him yet."